Consistent with the State Water Resources Control Board’s guiding principles that view storm water and dry weather runoff as a resource and as required by SB985, the State Board adopted Guidelines for public agencies preparing Storm Water Resource Plans (SWRP) as a condition of receiving state bond funds for storm water and dry weather capture projects. 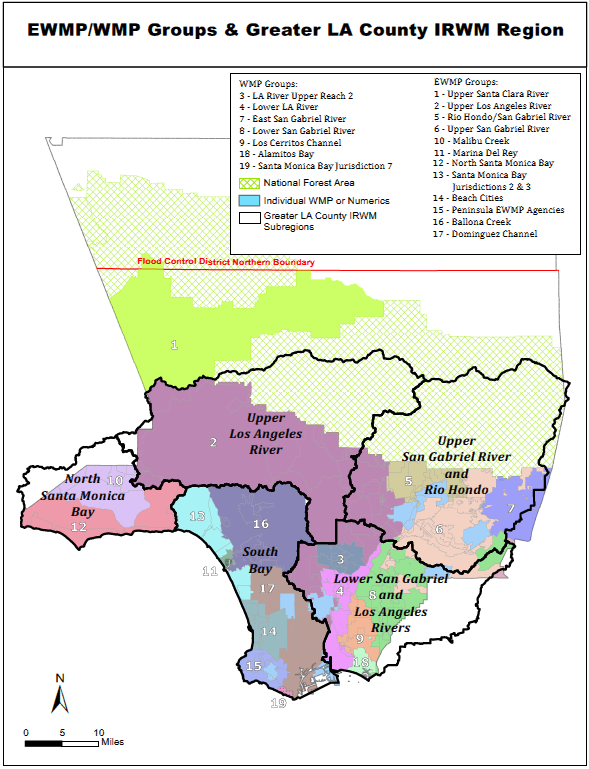 The Los Angeles region has an existing Integrated Regional Water Management (IRWM) Plan that has been expanded to meet the State’s requirement for a SWRP by incorporating the Enhanced Watershed Management Programs, Watershed Management Programs, Coordinated Integrated Monitoring Programs, and Program Environmental Impact Report. To address all requirements for the SWRP, the GLAC IRWM Plan has begun incorporating additional regional planning and monitoring efforts focused on storm water quality into its Plan as attachments. These planning and monitoring efforts are the Enhanced Watershed Management Programs (EWMPs), Watershed Management Programs (WMPs) and Coordinated Integrated Monitoring Programs (CIMPs) developed by municipalities in 2014-2016 to address their compliance with the Los Angeles Regional Water Quality Control Board’s 2012 National Pollution Discharge Elimination System Municipal Separate Storm Sewer System Permit (MS4 Permit). By including the EWMP and WMP plans under the “umbrella” of the GLAC IRWM Plan, the region will be able to have a unified approach in engaging the public in developing water projects for water quality, water supply, habitat, and recreation. The stakeholder outreach can be managed collectively which allows for efficiency, clarity and consistency and avoids redundancy. Under the 2012 MS4 permit, there are 19 EWMP and WMP groups comprised of the County, Flood Control District and cities with shared subwatersheds and water quality standards regulated by the Federal and State government. In addition, three cities opted to prepare individual WMP plans for their cities. The EWMP and WMP Plans provide detailed and computer-modeled strategies to address all dry weather and storm water pollutants. The map below shows the five subregions that comprise the GLAC IRWM region and the 19 EWMP and WMP groups. The boundaries of the IRWM subregions and the EWMP and WMP groups differ. The IRWMP boundaries were based on joining subwatersheds that were within close proximity to one another without regard to political boundaries. On the other hand, the EWMP and WMP boundaries were formed based on agency partnership agreements to achieve compliance with the MS4 Permit. Assess the chemical, physical, and biological impacts of discharges from the MS4 on receiving waters. Assess compliance with receiving water limitations and water quality-based effluent limitations established to implement Total Maximum Daily Load wet weather and dry weather wasteload allocations. Characterize pollutant loads in MS4 discharges. Identify sources of pollutants in MS4 discharges. Measure and improve the effectiveness of pollutant controls implemented under the MS4 Permit. The Los Angeles County Flood Control District (LACFCD), as a regional agency, is a member in 18 of the 19 EWMP and WMP groups and has been working with the applicable permittees as an equal partner to identify the types and locations of best management practices needed to achieve permit compliance within each watershed. In addition, the LACFCD recognized that implementation of the EWMPs and WMPs may potentially result in changes to environmental conditions. As a result, the LACFCD prepared the PEIR in compliance with the California Environmental Quality Act to provide the public and responsible agencies with information about the potential effects on the local and regional environment associated with implementation of the EWMPs and WMPs. The PEIR was submitted to the Los Angeles County Board of Supervisors and approved in May 2015. 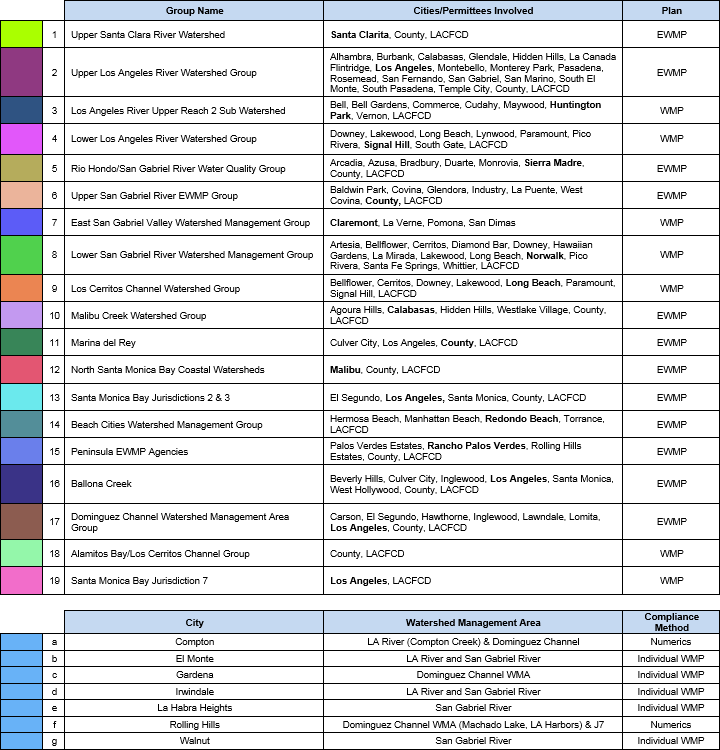 The downloadable SWRP Checklist and Self-Certification is specifically for the Upper Los Angeles River EWMP group which is identified as number 2 on the map. This group is comprised of the Cities of Alhambra, Burbank, Calabasas, Glendale, Hidden Hills, La Cañada Flintridge, Los Angeles, Montebello, Monterey Park, Pasadena, Rosemead, San Fernando, San Gabriel, San Marino, South El Monte, South Pasadena, and Temple City and the County of Los Angeles (Unincorporated County) and the Los Angeles County Flood Control District. Because each WMP and EWMP was developed for its specific area, each other group will need to provide a separate checklist identifying the page numbers where information is located.